Just above the confluence of the Wisconsin and Mississippi River lies a nine-mile prairie whose beauty and location has drawn people to its expanse for over 300 years. At this traditional gathering place of Native Americans, French explorers and fur traders stored goods and celebrated, in time building homes at la Prairie des Chiens. American soldiers constructed forts on the prairie to secure the upper Mississippi for settlement. Wave upon wave of people from the eastern United States then Europe arrived in Prairie du Chien by steamboat and railroad, and by 1900 a bustling city had spread across the plain. After World War I, tourists came to Prairie du Chien to drift along the banks of the Mississippi and climb the steep bluffs. Many of the residents of the prairie found a living in the bounty of the river, though often the Mississippi demonstrated its power by flooding the lands. In the midst of the Depression, the community began to preserve buildings that reflect the history and heritage of Wisconsin's second oldest community. 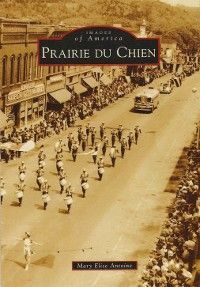 With over 200 images, the book traces this history of Prairie du Chien from the time when Native Americans inhabited the prairie to the flood of 1993. This pictorial history of Prairie du Chien is part of the Images of America series.